The central locale of Georgetown DC offers something for everyone. Sights range from historical and cultural to shopping and dining. If you’re planning a move to the District of Columbia, our Georgetown DC apartments offers high-end amenities in an appealing location. 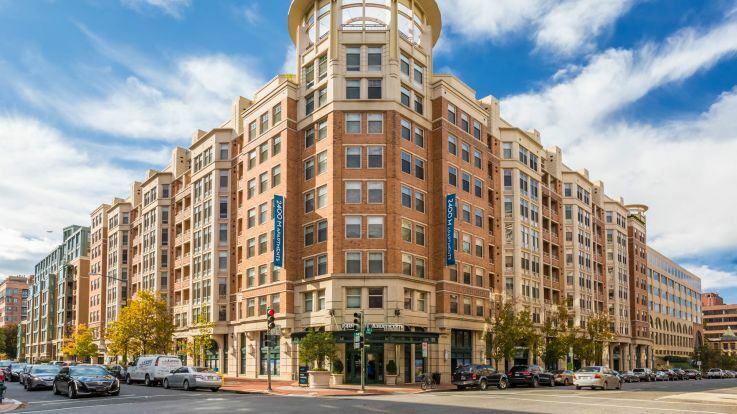 Our Georgetown DC apartments are located in the heart of the neighborhood. Georgetown is home to many cultural and historical sights. There is no other neighborhood in the United States with as much Federalist style architecture, which is why it was declared a National Historic Landmark and added to the National Register of Historic Places in 1967. Georgetown has been home to numerous historical figures, including Thomas Jefferson and John and Jacqueline Kennedy. Georgetown is also a center of culture, with the prestigious Georgetown University and numerous galleries all within walking distance. Sitting on several bluffs high above the Potomac river, Georgetown DC’s steepest streets run from the north to the south. Some of them are unpaved, and others are covered with cobblestones. All of them are lined with picturesque trees and planted greenery, making them pleasant for pedestrians and drivers alike. While these streets present a challenge to walkers not used to hilly terrain, they also offer some great outdoor workout opportunities, with breathtaking views extending out across the river. Residents of Georgetown, D.C. apartments are often avid outdoors explorers because the neighborhood offers great jumping off points to explore the surrounding area. The nature preserve and national memorial, Theodore Roosevelt Island, is a short trip across the Key Bridge, and the Chesapeake and Ohio canal, which at one point in the mid- 1850s was built to connect the city to Harper’s Ferry, is a great corridor for casual strolling or bike rides. With pretty vistas, quaint street scenes, and great shops, bars, nightspots and dining, it’s no wonder that this residential area is also a hot-spot for tourists all year round. Our Georgetown DC apartments are also near everything else that the District of Columbia has to offer. From Georgetown, it’s easy to get around and see other sights such as Adams Morgan, the National Mall, or even the White House. Our Georgetown DC apartments offer many appealing amenities. These range from concierge service and a private rooftop pool to covered parking and a fitness center. You will not want for much while living in our Georgetown DC apartments. They are a premiere choice for anyone planning to relocate to the area.